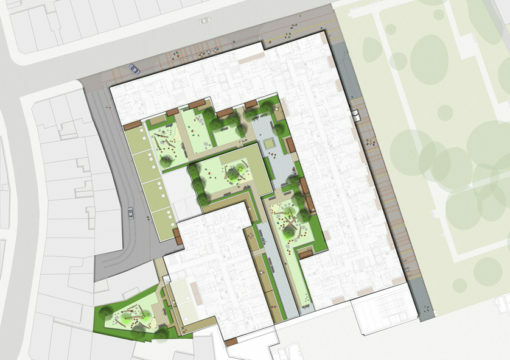 Our developer client appointed us as landscape architects on this proposed 144 residential units, 5,000m2 commercial space and 2,444m2 refurbished retail unit mixed use development located in West London. We were tasked to develop a landscape design to the satisfaction of our client the to prepare landscape architect ‘s information to support detailed Planning submission. The site is located at the heart of Acton town centre and is intended to provide improved shopping facilities at ground level and significant housing above. This development is part of the continued planed regeneration of this area. 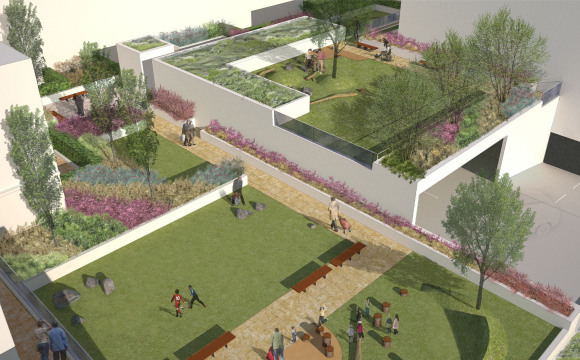 At ground level, our landscape design addressed the proposed buildings interface with the existing urban context. The needs of deliveries, commercial unit access and pedestrian access were all considered within our landscape design. The banding within the ground floor paving pattern responds to the elevational treatment of the building, providing a suitable context in which the building is to be located. We proposed new connection routes from the proposed development into an adjacent existing park. The intention of this proposal is to bring this under used park into common use and to create a safer, self policing environment. Our landscape architect’s second and third floor landscape design responds to the needs of the adjacent proposed residential units. Enclosed private patios are dedicated to all adjacent residential units. Communal spaces are proposed for use of all residents at second and third floors. These include hard and soft landscape elements and three informal play areas split between two levels. In locations where roofs are not publicly accessible, Sedum green roofs were proposed. Both second and third floor landscapes are located over podium decks. 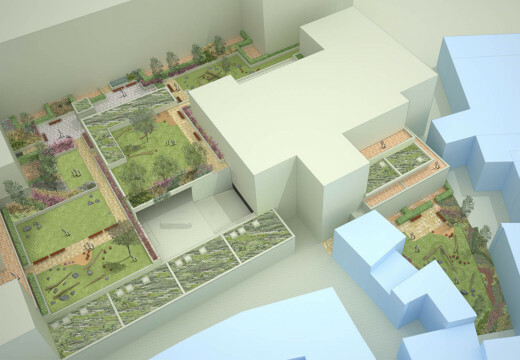 Our landscape architects were also commissioned to carry out a landscape appraisal of the small park, formally a burial ground, adjacent to the above mentioned proposed residential development. This appraisal was prepared to support the detailed planning application for the residential site. The details of this report informed the boundary treatment between the two plots and the locations of proposed connection into the existing park. This document helped to support the argument that the connections proposed would help to enliven and reinvigorate this under used public space.